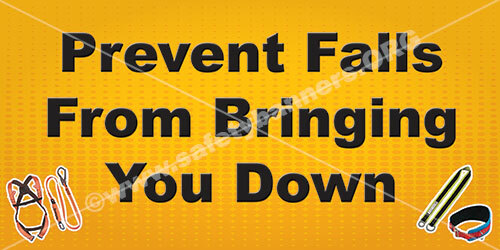 Slips, Trips and Falls Safety Banners for American industry. Safety Banners built in Memphis, Tennessee USA. 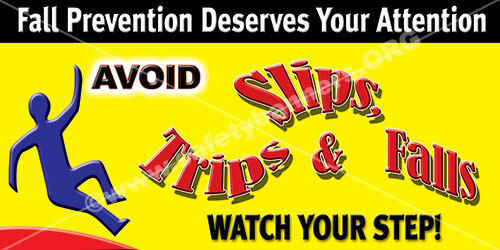 Our Slips, Trips and Falls Safety Banners are used by most of the Fortune 500 companies! 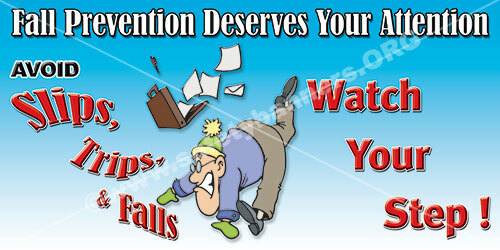 Slips, Trips and Falls are a serious problem in American industry! 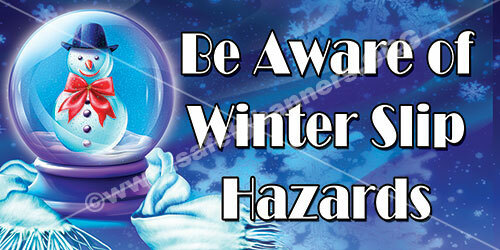 Safety Banners can help!! 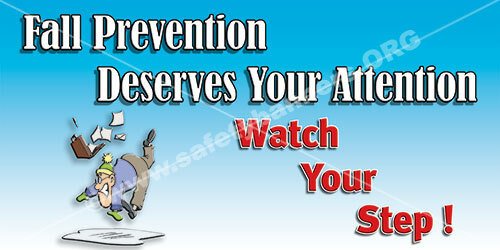 Employee exposure to wet floors or spills and clutter that can lead to slips/trips/falls and other possible injuries. Keep floors clean and dry In addition to being a slip hazard, continually wet surfaces promote the growth of mold, fungi, and bacteria, that can cause infections. Provide warning signs for wet floor areas. Where wet processes are used, maintain drainage and provide false floors, platforms, mats, or other dry standing places where practicable, or provide appropriate waterproof foot gear. Walking/Working Surfaces Standard requires: Keep all places of employment clean and orderly and in a sanitary condition. Keep aisles and passageways clear and in good repair, with no obstruction across or in aisles that could create a hazard. Provide floor plugs for equipment, so power cords need not run across pathways. Keep exits free from obstruction. Access to exits must remain clear of obstructions at all times. It’s probably happened to most of us. That momentary lapse of inattention thinking about a personal problem or distracted by an activity that ends in a slip, trip or fall. A stumble down a stairway. A trip over an uneven surface. Slipping on the ice. It can lead to a variety of regrettable events ranging from a simple bruised shin to an extremely serious injury. 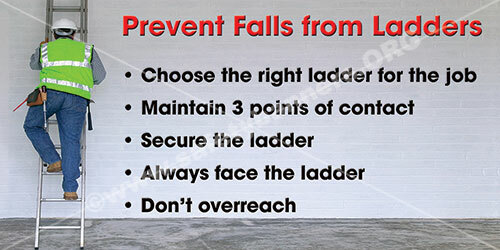 It’s just one of a variety of conditions and situations that set the stage for slips, trips and falls in the workplace. In general, slips and trips occur due to a loss of traction between the shoe and the walking surface or an inadvertent contact with a fixed or movable object which may lead to a fall. There are a variety of situations that may cause slips, trips and falls.